I'm realizing that I've been fixated on this need to spotlight teams with "original" monikers and I think it's time to switch things up a little bit. Just because a team was called the "Midland Angels" doesn't mean it lacked an identity of its own. It might just seem like some weird combination of logos from the Los Angeles Angels and Texas Rangers, but this Midland Angels cap from the mid-1990's is a fine example of a minor league club achieving an ideal balance of showing respect to its parent team while also displaying (Texas-sized) state pride. In 1999 though, things became more confusing for baseball fans in the Southern Plains of western Texas when the team's 14 year long affiliation with the Angels ended and a new one (that still lasts today) began with the Oakland Athletics. They rebranded themselves as the Midland RockHounds, a nickname that I still do not understand. I guess there are special dogs that roam patches of rocks in Midland, TX? Someone enlighten me please! Looking back, I never thought it strange that the signature Angels halo should hang off the panhandle of the outline map of Texas rather than California's. The symbolism of the star is appropriate for both states (albeit for different reasons) and it's well-played that the "M" features the varsity font used by both the Los Angeles Angels and the Texas Rangers. I think it's fitting that a town called Midland should serve up such a fine compromise for its baseball fans who must undoubtedly be natural fans of the Texas Rangers; after all, Midland got its name based on the fact that it's in between Fort Worth and El Paso. That's meeting 'em halfway I would say. Truth! For reference, the tags on the sweatband are identical to those on previously featured caps such as the Hickory Crawdads and probably others that I just haven't featured yet! One of the hardest (and sometimes most fun) aspects of collecting minor league ballcaps is that the logos can vary greatly year after year. While I think it definitely makes collecting more interesting, tracking down the specific style that you're looking for can be a challenge. The great thing about the Midland Angels logo is that it remained about the same for about a decade, making your chances of finding this cap less impossible than other caps out there! Update: After further research, I've concluded that this cap is from 1996. While this particular version of the Midland Angels logo is from 1994 at the earliest it is important to note that this cap is free of the "New Era Flag" tag, which first appeared in 1997. Also, the MILB batterman logo started making its presence on caps in 1996 and this can be confirmed by taking a look at these Phoenix Firebirds caps from 1995 and 1996. I suppose that my connection to this cap doesn't have any sort of firm basis other than there was a player who was on the team in the early 1990's who I thought had amazing talent. 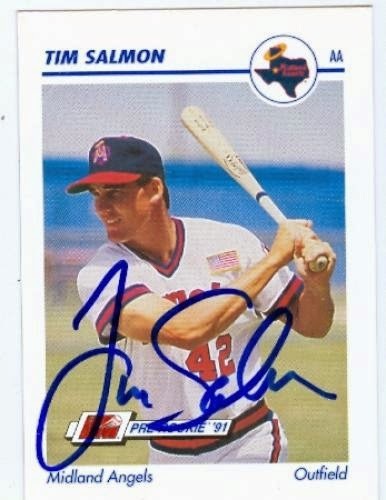 That guy's name was Tim Salmon and he ended up having a solid career that lasted 14 years, all of which he played with the Angels. That says a lot about the willingness of both a player and team to stick together for that long. He broke into the big leagues in 1992 and won the American League Rookie of the Year award that year on the strength his 32 HR and 95 RBI through 142 games; imagine what could have happened if he had played the entire season! His numbers stayed consistent his entire career, which is another reason I think this guy really deserved all the attention he received. The only thing I don't like about Tim Salmon (other than his alarming strikeout rate) is that he was on the 2002 Angels team that beat my beloved San Francisco Giants in the World Series. Oh well, I can't hold a grudge forever I suppose. hi uptown, i'm glad you are a big fan of jeter! While i'm sure there will be a time when i must part with the autographs, i don't think that day has come yet. thanks for the support!